Hair transplantation is getting common over the globe due to its revolutionary results and non invasive techniques. Advancements in the hair transplant procedures are refining the results in terms of quality and durability. Such advancement in hair transplant procedure is Bio-FUE, which is one step ahead from the normal FUE procedure. Bio- FUE has refined the results in terms of quality, growth and stability of transplanted hair. This procedure is perfect combination of the basic procedure of FUE and the bio Therapy. NHTC is pioneered in Punjab for inducing this revolutionary technique for hair restoration. NHTC is the finest Bio-FUE hair transplant centre in Jalandhar, Punjab. Same as the FUE procedure, in this advanced procedure also hair follicles are extracted and transplanted individually. Carefully team of surgeon chooses the loss resistant hair follicles from the stable zone of head and then extracts them individually according to requirement. Then the donor hair follicles are counted, sorted and placed in sterile controlled environment so that follicles can retain their properties even after transplantation for lifetime. Then the transplantation of these healthy follicles has been done with proper care so that patient can have natural look. After the completion of basic FUE procedure, Bio part of the BIO –FUE comes into action as in this part some growth factors are injected in the donor and transplanted areas to give better results to patients. Before starting the surgery, patient’s own hair is drawn out in small amount and centrifuged to separate the growth rich platelets that have 4-5 times more concentration than normal blood. 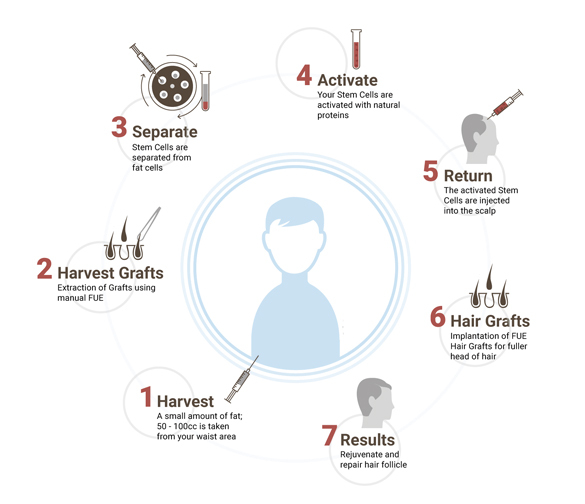 As the final step of Bio-FUE surgery, regenerative cells are injected in the recipient area for faster recovery and to stimulate the hair growth. Even these cells also improve the quality and density of both existing and transplanted hair. WHO ARE CANDIDATES FOR BIO- FUE? Same as the normal FUE procedure, both men and women of all ages can get benefit of this advanced procedure if they have best physical and mental health along with the realistic expectations. The patients that have strong desire to get short hair style without any fear of being noticed after transplantation procedure can get benefit from this surgical method. Even the patients with limited donor supply and scalp elasticity can get feasible results from this procedure. However the patients that have some blood diseases or infections or other medical contradictions cannot go for this procedure. People addicted to smoking, alcohol consumption or drug abuse are not considered as ideal candidates for the Bio-FUE hair transplant surgery in India. It makes the healing process of donor and transplanted areas , faster.